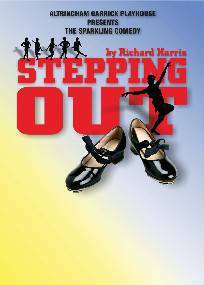 Stepping Out, which enjoyed a successful West End run at the Duke of York’s theatre, is a warm and very funny play about the lives, laughs and loves of a group of women (and one man) attending a weekly tap-dance class in a dingy North London church hall. There is ex-professional dancer Mavis, who runs the class; cheerfully overweight Sylvia; Andy, a plain do-gooder with no confidence; Maxine, attractive, sharp and very shrewd; fat, plain Lynne; Rose and Geoffrey, the lone male. As the play progresses, the class’s dancing improves to such an extent that by the climax, a grand charity show performance, they have been transformed into triumphant tappers, worthy of any chorus line. Voted Comedy of the Year by the Evening Standards Drama Awards in 1984. Do not let the fact that?Stepping Out?is a relatively small fish in the big theatrical pond put you off making a trip down to the Garrick if you have the chance. It is without a doubt one of the most entertaining shows I have seen this year - amateur or professional. A fantastic side-splittingly, rip-roaringly laugh-out-loud - but simultaneously provocative - performance, I think it could turn even the most cynical of philistines. From the moment you are introduced to the mismatched and cringingly uncoordinated members of Mavis' dance class you feel an instant connection and warmth towards them. As they attempt to control their numerous left feet as they rehearse for the big dance show at the finale you can't help but will them on every step of the way. This is in no small part to the brilliant direction by Terry Chandler of Richard Harris' cockle-warming script but the moving and perfectly executed depictions of the characters by a wonderful 11-strong cast certainly did no harm. Dawn Flint's Dorothy could have been pulled straight from a Victoria Wood sketch, Marina Anderson's Andy was tinged with just the right amount of tragedy and Laura Chandler's portrayal of tart-with-a-heart Sylvia was absolutely hysterical. Apparently the opening nights have been sell-outs and once word-of-mouth gets going it could be nigh on impossible to secure a much-coveted seat. So hurry! Stepping Out?is one of those plays that makes you feel all warm and fuzzy. The setting is a north London church hall, home to a dance class where the criterion seems to be that you must have two left feet in order to get in. The students are hopeless and they even make a mess of the most basic steps. Richard Harris's play also lifts the lid on the private lives of the dancers and there are some touching moments along the way. Dance teacher Mavis really has her work cut out when she agrees to put her troops into a charity event, and we follow the tears and tantrums that invariably arise as they undergo rigorous rehearsals. Harris's heart warming, against the odds story was transferred to the big screen and the film version starred Liza Minnelli. Terry Chandler, who is directing?Stepping Out?for Altrincham Garrick, says there isn't a huge amount of difference between the stage and screen versions. "The story is more or less the same as the film - they all go to the tap class on a Thursday night and they all have their different reasons for going. Their journey to fulfilment is quite emotional, in that they start off not knowing each other very well and, as the play progresses, they learn more about each other and we learn more about them," he says. This is a hugely popular play and the movie was equally well received. Does Terry have any thoughts on as to why?Stepping Out?is so popular? "I think it's popular because it's one of those feel good factor shows. It's extremely well written and it's a lovely piece of theatre," he says.